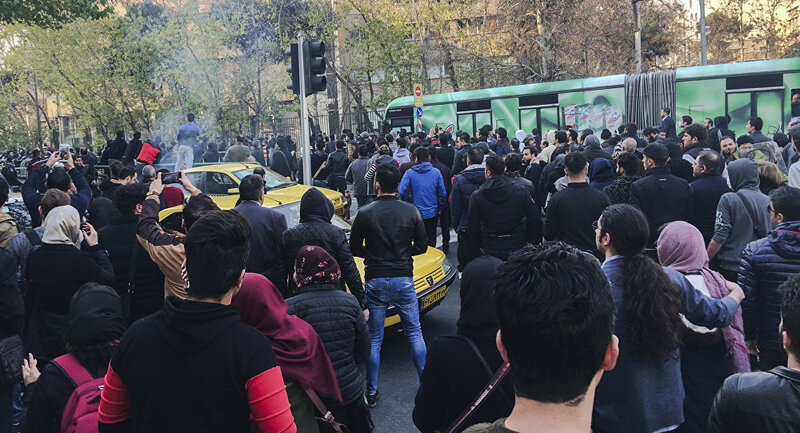 Within the last week, Iran has been engulfed in the surge of the public discontent and protests, prompted by high fuel and food prices, unemployment, inflation and air pollution. As a result, about 20 people have reportedly been killed, and 450 were detained. US President Donald Trump promised that Iranians protesting against President Hassan Rouhani's government will receive the US assistance "at the appropriate time." "Such respect for the people of Iran as they try to take back their corrupt government. You will see great support from the United States at the appropriate time!" Trump said on Twitter. — Donald J. Trump (@realDonaldTrump) 3 января 2018 г. The statement was made amid protests raging in the country: the same day several hundred people took to the streets of a number of Iranian cities to protest against outbreaks of violence during anti-government demonstrations that hit the country over the last week, the largest in nearly a decade. They were prompted by a surge in fuel and food prices and high rates of unemployment, inflation and air pollution. At least 20 people have reportedly been killed so far, and 450 people have been detained. Ayatollah Ali Khamenei, the Iranian supreme leader, has accused "enemies" of Iran for the deadly protests on Tuesday, pointing out that they had "used the various means they possess, including money, weapons, politics and intelligence services, to trouble the Islamic Republic." The same day, Iranian Foreign Minister Javad Zarif said that Iranian citizens have the right "to vote and to protest," unlike the US allies in the region, noting that the authorities would not allow "infiltrators" to sabotage these rights "through violence and destruction."